Maxed Out Credit Cards - Will it hurt my credit scores? Home / Credit Repair Blog / Maxed out credit cards -Does it hurt my credit? According to the Federal Reserve, the average household credit card debt is at approximately $16,000. Maxed our credit cards are an epidemic. With this much debt it isn’t surprising that many people are in danger of maxing out their credit cards. It’s a good idea to stay well below the limits imposed on a credit card. This leaves a little wiggle room if an unexpected emergency would come up. If you would happen to exceed the credit limit on your card, the following is what you could expect to happen. The first and most obvious consequence of maxing out a credit card is that there isn’t any credit left to use if it’s really needed. At the very least, a person would need to pay a minimum balance in order to be able to use the card again. Once the limit has been passed, however, simply bringing the balance back down may be the least of the card holder’s worries. Maxing out a card can cause your credit score to drop. How much available credit an individual has is a big factor in determining a credit score. This is called a high credit utilization ratio. The utilization ratio is determined by the amount of credit that is available on your cards to the amount that you’re using. It’s always ideal to have a utilization number that is as low as possible. Whenever you attempt to take out a mortgage or apply for any other type of loan, the fact that you maxed out your credit card will appear on your credit report. Going beyond your credit limit may cause the company to charge an over-the-limit fee. Simply carrying a high balance could cause you to be pushed over the limit with finances charges. APR (annual percentage rate) is the percentage of interest charged on the amount that’s owed on the card. Your interest rate or penalties may be charged at the highest APR a credit card company can legally charge. That rate is currently 29.99 percent. 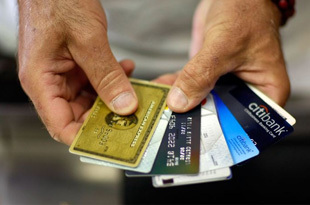 Credit card companies can close an account for many reasons and sometimes choose to do so if the limit has been passed. If your account has been closed it is advised to call the company as soon as possible. If they verify that the account has been closed because you’ve passed your limit you should make a payment as quickly as possible. If you’re able to make a payment so you’re no longer over the limit they may reinstate your card. If you’ve gone over your credit limit, have incurred penalties, or even had a credit card account closed, there are things you can do to help fix your credit. Feel free to call our office at 617-265-7900 or schedule a free consultation.